Winner Poker Review - Grab a €1,500 First Deposit Bonus! If you go to the Winner Poker website, you'll find they do seem very confident that they are the best online poker room around, which is a little bit of a boast for a poker room that is simply part of the iPoker/Playtech empire. You have to ask what sets Winner Poker apart from the other thirty or so casinos that form part of the extensive iPoker network and contains huge names such as William Hill, Bet365 and PaddyPower? So the question I am asking is really: What makes this site a winner? When you first enter the Winner website you might find yourself a little overwhelmed, as it is a bit flashy. There's a lot more to the Winner site than just poker - the whole Winner gaming experience takes in casino games, sports-betting and bingo as well. There is an animated window on the Winner site which the "Download" button pops in and out of - so you'll need a little bit of skill in catching the button! If you miss too many times you can use the link in the top left hand corner of the menu. As you will know if you've read other reviews on this site, Playtech-based software is not available in your browser, nor does it run for operating systems other than Windows, so if you use Linux or a Mac then Winner is not for you. Winner does score some brownie points though as it is one of the rare Playtech casinos that offer a mobile version of their poker site for portable devices, and for both iOS and Android, which is excellent news for those who like to play their poker on the go. So, to begin your registration first you must download the software. Use the links mentioned above. This only a small file but it will download all the other necessary files whilst it is installing. This shouldn't take you too long if you have a decent connection. Once everything has downloaded just click on the new link on your desktop to launch the casino. There may be a few more updates to run through. The first thing you'll need to do of course is register, which you do by clicking the big green "Join Now" button. Just fill out all your personal information, and you'll be all set! Winner certainly does not skimp on its First Deposit Bonus package, as it offers new players a rate of 250 percent up to a mammoth €1,500. This means that if you deposit €500, you will receive the full bonus back. This sign up bonus is released in increments, depending upon how may Winner Poker Points you amass, which you gain at the rate of 16.875 for €1 of rake generated or tournament fees spent. If you chose GBP as your chosen currency you will receive 20 points per £1 generated. Every 473 points you accumulate, you are handed €5 in bonus cash. These do seem like odd numbers, but it means you need to generate around €28 of rake or fees to release €5, and you will need to amass €8,400 in rake and fees to release the full €1,500 bonus - which means you will have to undertake some pretty serious poker playing as you only have a month from the award of your bonus to release as much of it as you can. In addition to your bonus, new depositors are allowed access to some exclusive freerolls, with chance to win $25 daily - and the weekly $250 new depositors freeroll as well. Naturally, if you've played at a Playtech/iPoker site before, you'll know what to expect when it comes to the poker client, as this is the standard Playtech client with the Winner branding. By using this client you will of course have access to poker cash games, sit and go tournaments and scheduled tournaments that are currently running across all thirty-one poker rooms that belong to the iPoker network. This means you are never likely to be short of opponents. The client is extremely functional - you can usually find your way to a table that meets your fancy within a few clicks, and if you are not too bothered where you end up, you can always use the quick seat option where you simply select a few parameters and the client heads off and finds a table for you. You can also manage your preferences via the client, and make deposits to and from your poker account. The handy thing about a Playtech client is once you have grown used to how the client operates in one iPoker poker room, you do not have to get used to a different client if you sign up for one of the other Playtech poker rooms. Freerolls through to €375 + Special Events. 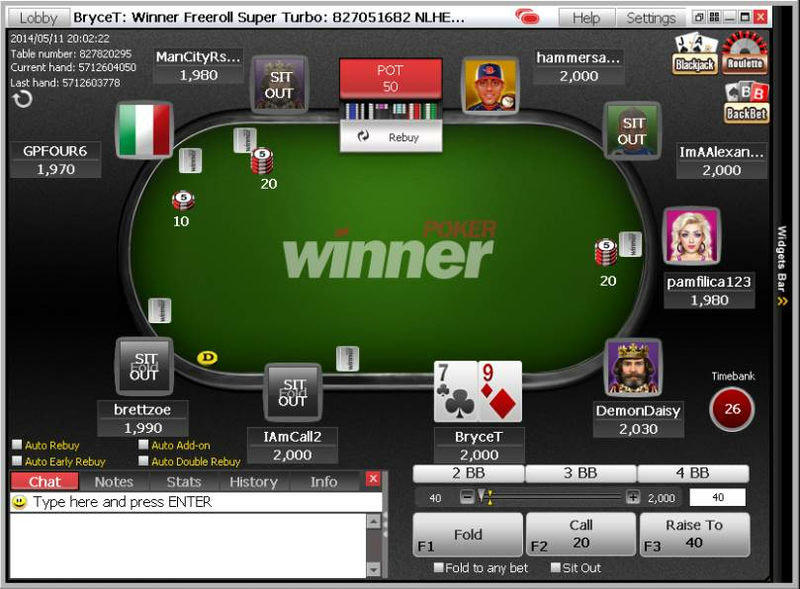 There are no play money tables available at Winner Poker, so I had to be content with a massive free-for-all Turbo Freeroll tournament. I find MTTs a little boring as it's quite easy to advance to at least the last dozen or so players just by playing very tightly, although you do find that someone has had a bit of a lucky run and now has eight times as many chips as you! I registered for the tournament, which had a scheduled start time, so I had to find something else to do for four hours! Eventually the time rolled around - over 250 players had signed up and it was time to take to the tables. Of course, this being an iPoker/Playtech client I knew what to expect. 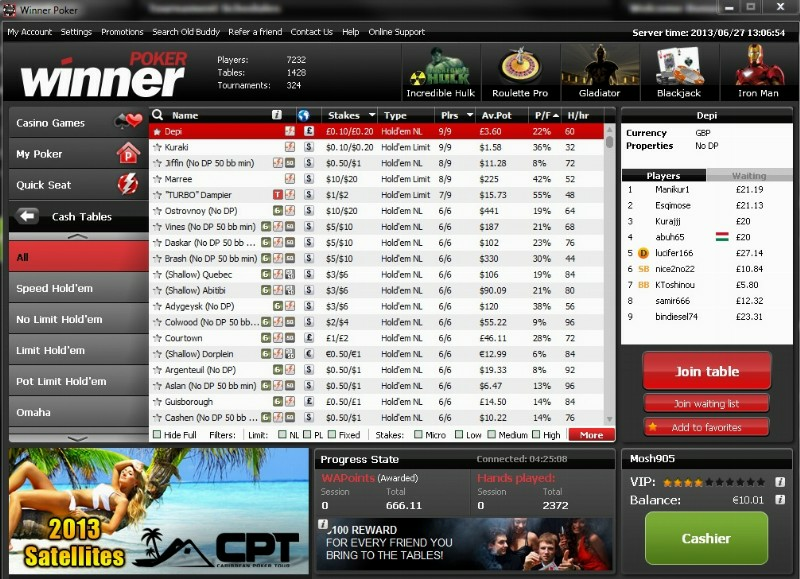 I have mixed feelings about the Playtech poker table software - I love its functionality, but I just don't like the look. I also find it is a bit slow at mucking the cards and rolling around the table. Still, I have seen far worse poker table clients, so it's good to know with Winner I'm going to be seated at a familiar-looking seat! I won't say how I did in the tournament - let's just say my new bankroll meant I had to search for another freeroll! WinnerPoker does not accept US-based players and players from many other countries - check the site's T&Cs. The promotional emphasis at Winner Poker is definitely on new players with that stupendous First Deposit Bonus, and other freebies. There are also some nice little extras available, like the best hand of the day on any of the Winner poker tables being awarded $100. There is also a little oddity called the "Bad Beat Bonus" where, if you think you have the "nuts" and it's at least Four Kings and you still get beaten, then you can email Winner Poker and claim $250. I'm not sure I've ever seen Four Kings (or higher) ever get beaten on a poker table, but it's a nice little parachute in case the unthinkable does happen. As you would expect, Winner Casino has its own poker VIP scheme. You start out at Amature (sic) level, and progress through the levels by gaining Winner Points at the rates explained above. The higher the level you obtain, the more rewards you are entitled to treat yourself to, and if you average 62,500 points a month you've reached the highest level, and you can expect exclusive freerolls, the top rate of cashback, and access to the VIP store. WinnerPoker has a poker client that is available for Android, iPads and iPhones. I had opportunity to use both online and email support at Winner, and was completely satisfied with both of them. The online support is available via the client when you log in, and my queries were immediately and effectively dealt with. I was suprised by how quickly my email was answered - even though I sent the email on a Sunday it only took twelve minutes before I received a response. There are also FAQs on the Winner Poker website. and 25 others - check the site! The question I posed at the beginning of this review was "is Winner Poker a Winner?" - well, through my intitial experiences with this casino I think I can put my vote down for "Yes" ! That €1,500 bonus really is something else, even though you're going to have to go through a great deal of poker-playing to get your hands on it. I am a genuine Playtech/iPoker fan and I'm even prepared to forgive them for what I think is a fairly naff table design with those half-cartoony avatars and the too-colorful chips. I love the controls at Playtech - nicely and thoughtfully set up for semi-serious poker players just like me. I think I can safely say that if you sign up with Winner Poker, you could be onto a winner!